With the largest selection of Prime Beef on the north shore, Acquistapace’s is your one-stop shop for quality meat. 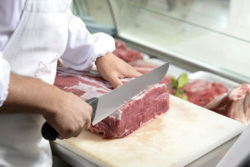 One reason is the quality of our meat, but another is we have butchers on site who know how to properly cut meat. How meat is sliced is key in how well it cooks (and eats!) and no one does it better than Acquistapace’s. So whether you’re looking for something as simple as ground beef, or something as delicious as a ribeye, a strip steak, or tenderloin, we have it for you here at Acquistapace’s.